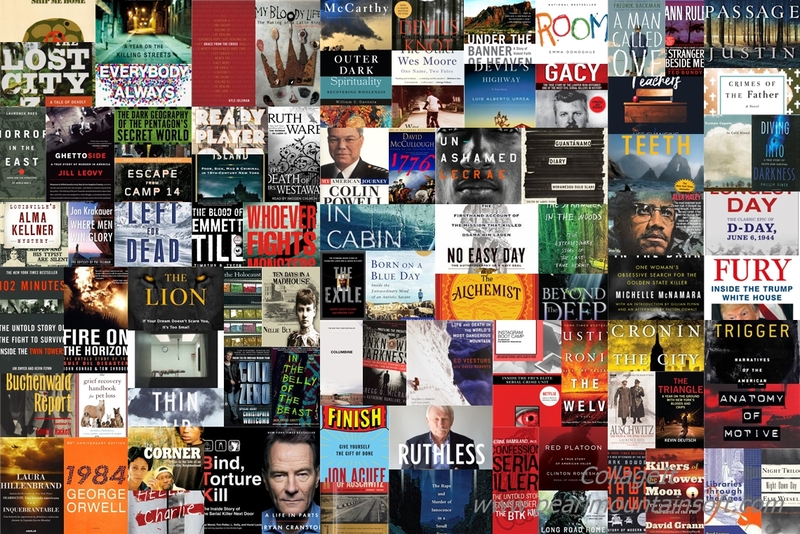 Over the course of a year, I finished 88 books (75 of them in 2018). One of the many points Jon made that held true for me was tracking progress. When I got started, I dropped certain information into a spreadsheet and updated it as I went along (I didn’t find Goodreads until later on). Through the course of the year I read a total of 27,181 pages and it took me, on average, to finish a book in 4 days. 27,181 pages. That number still blows my mind when I see it. That is a pretty astonishing number for someone that never considered themselves an avid reader. Before I got started, I thought “I don’t want to spend hundreds of dollars on books” which is why I was thankful for Jon’s list as he recommended the local library. As crazy as it sounds, I had never considered that. Our local library (Louisville Free Public Library) is a fantastic resource. In fact, 59 books that I read came from the library. Almost always, when I tell someone that I have been trying to read more, I am usually met with “I just don’t have the time to read more” or “how do you find the time to read that much?” As painful as it is to admit, social media consumption was draining so much of my time. Many mornings I had time before work and would find myself endlessly scrolling social media consuming absolutely nothing worthwhile. I would just sit there swapping between apps doing nothing at all. I find it a little ironic that some of the same people that say they don’t have time to read are also some of the same people that post every couple of hours on Facebook. Regardless, I started by first replacing that social media time with reading. Which carried over to wanting to read instead of watching TV or scrolling through my phone at night before bed. I was surprised at how much I could read in that amount of time. The more I read, the less I wanted to scroll through Facebook. One of Jon’s suggestions was to keep a book ready. I quickly created and used a wish list. As I got a few days out from finishing the book I was reading, I could easily go to our library’s website and request the next book that I wanted to read. I usually timed it just right so that I could return what I had just finished reading and pick up the next book on my list. I want to put Red Platoon and The Devil’s Highway in the top 5 because that book was so amazing as well, but Columbine was just such an overwhelming and powerful book for me that I had to sneak it in there. Here are all of my favorites so far on Goodreads. I also have to give a notable mention to trilogy from Justin Cronin (The Passage, The Twelve, and City of Mirrors). I am such a critic of how books end and not only did he do such a fantastic job throughout each of the books, but the ending was one of the most perfect endings ever. How did you pick what to read? When my friends follow my Goodreads account, some have made comments about the darker nature of some of the books that I read. I really don’t know where that comes from. First, I believe that a trap many fall into with reading is that they feel some obligation to read books associated with their job. “Oh, you are in marketing, so let’s grab a bunch of marketing and business books to read.” But how much fun is that? You spend all day doing something at work and then read about it in your free time? For me, I purposely found books that were not related to my job and read those. The darker nature of some of the books probably stems from my time as a police officer. Non-fiction and true crime has always interested me. Some of the true crime that I read was so far out there that at times it felt like fiction. Katherine Ramsland’s book about Dennis Rader, BTK, felt like something Stephen King would make up and write about, yet it was a true story. More times than not, while reading one book, another topic or person would be introduced while reading so I would just make a note and add it to my “want to read” list. The bottom line is that I knew I had to pick subjects that I wanted to read or else I would stop. And I knew that I had to keep the next book on deck waiting so that I could keep the momentum going. So next year, do you want to read more? I still want to keep reading. I like the momentum and I have really enjoyed reading. It becomes addictive and I have learned so many things about so many subjects that I had only previously heard about. I never felt pressured to read a certain amount within a certain amount of time. I never felt like I had to read a specific number of books in order to consider this a success. I just wanted to read and enjoy it. I have to admit that the more that I read, the more I want to write my own book. After reading The Passage trilogy from Justin Cronin, that series more than anything else triggered a deep desire to write my own book. I have started to spend time writing, but much like the goal to read more, I am hesitant to place a specific deadline on my own book because I don’t want to rush or force it. Maybe in another year I will be able to write a blog post about how I started and finished my own book. Who knows? What were all the books you read? Again, here are all of my favorites so far on Goodreads. If you are still with me to the end of this post, I am curious. What books have you read that you would recommend I read?